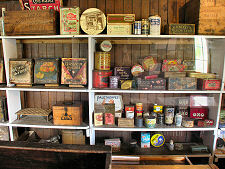 The fascinating Atholl Country Life Museum occupies an old school just to the west of the bridge over the River Tilt in the village of Blair Atholl: if approaching from the south east, watch out for the turning on your left immediately beyond the bridge. 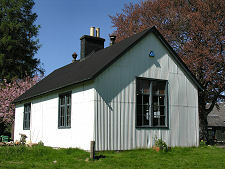 Ample parking is available, and visitors to the museum can also call in at the neighbouring cafe and the nearby Atholl Estates Information Centre. The schoolhouse was built in 1865, according to a date inscribed on a gable near the main entrance. The school continued to serve the local community until it closed in 1974, when the pupils transferred to a new school built in nearby Bridge of Tilt. The old school then stood empty until 1981, when the Duke of Atholl made it available to house a large collection of artefacts and images relating to the social history of Atholl. These had been collected over many years by John Cameron, a local farmer who had attended the school and whose family had lived in the area since the early 1700s. The collection opened its doors as the Atholl Country Life Museum in 1982 and has since continued to grow, today providing a remarkable insight into aspects of the lives of people who lived in Atholl which would otherwise be lost and forgotten. 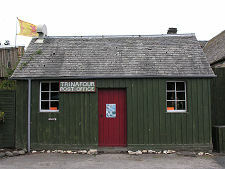 The museum is divided into three main rooms, and has been extended to include a wooden post office building relocated from Trinafour, a small settlement in a remote location at the head of Glen Errochty, nine miles to the east of Blair Atholl. 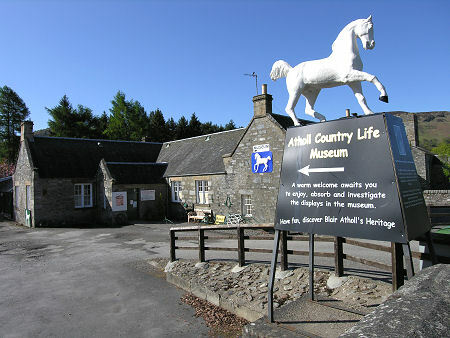 You enter the museum via a lobby which is home to a white horse which once stood on top of an arch leading to the courtyard of the Atholl Arms Hotel. The three main rooms form a circular tour around the museum. 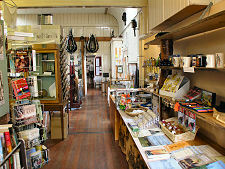 The room on the left from the lobby contains a range of displays about different aspects of life in Atholl. 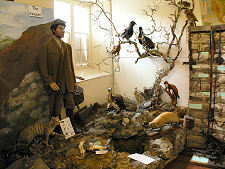 One corner has a fascinating display about the life of a keeper and includes a life size model of a gamekeeper alongside representatives of many of the wild creatures who live, or lived, in the area, including stoats in their winter coats, a badger, a hare, a pine martin, a beaver and a Scottish wildcat, plus a number of game birds. On closer examination the keeper is carrying a range of devices like mouse traps, mole traps, rabbit traps and a salmon spear, while arrayed on a nearby wall are traps for everything from foxes to poachers: the latter comprising a tripwire that activated a blank shotgun cartridge to scare away the poacher. Like some of the other devices on view, we doubt that its use would be legitimate in modern times. Nearby is Dr Anderson's sleigh. Dr John Anderson was a native of Shetland who practiced medicine in Atholl from 1894 until his death in 1936. 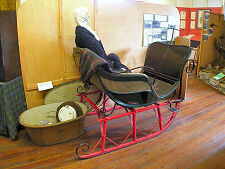 He used the sleigh, drawn by a horse, for house calls on patients in the more outlying areas in the depths of winter. 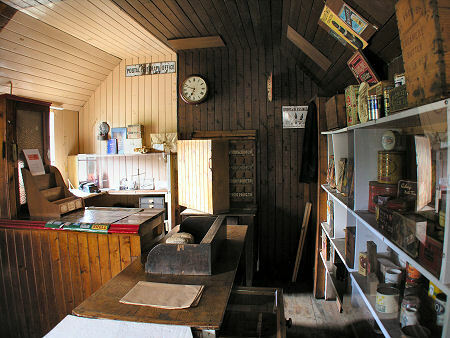 A corridor gives access to the interior of Trinafour Post Office, which looks and feels exactly as it would have done in the 1930s, even down to the stock on display behind the counter and the phone next to the door. 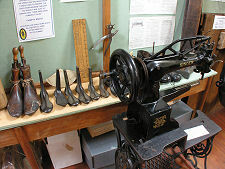 Back in the main building, the second room includes the museum's shop. 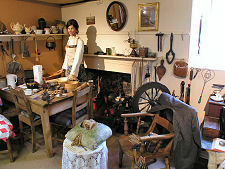 The room's highlight is the recreation of a typical cottage kitchen from about 1900s with the daughter of the house preparing breakfast, while on the other side of the room her father is just emerging from his box bed, complete with nightcap. This room is also where you find the museum's remarkable collection of horse harnesses and collars, a reflection of a time right up to the 1950s when the only motive power on most farms was the horse. As you enter the third main room your attention is immediately taken by the huge wooden trophy on the right. This is the Caledonian Challenge Shield, believed to be the world's largest sporting trophy at 9ft 6in high. 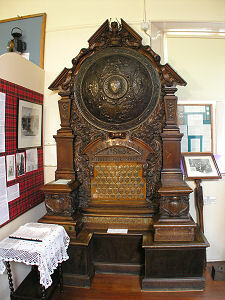 The shield was commissioned in 1863 by the 74th Highland Regiment to serve as a trophy for an annual rifle competition, and comprises a 3ft diameter bronze shield set into a massive oak frame. This continues to be competed for today. This room is also where you find the museum's highland cow, a real stuffed highland cow being milked in a byre in one corner: an everyday feature of life across the area for centuries. 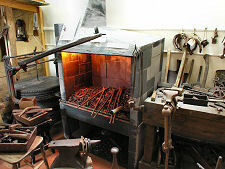 Nearby is a recreation of a smithy, complete with an atmospheric forge and anvil. One object in this room sums up the very human approach taken by the museum to its displays. 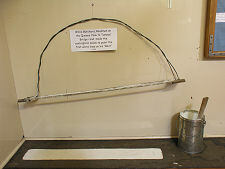 This is a home-made stencil used by Willie Butchard, who was responsible for maintaining part of what is now the B8019 along the north shore of Loch Tummel. He used it to paint the white lines down the middle of the road.